Each individual nutrient element has a specific role in plant growth. If one is missing or in short supply, the effectiveness of others is reduced and growth will suffer. For example, magnesium and nitrogen are necessary in the production of chlorophyll. However, if magnesium is lacking, chlorophyll production will be restricted. Quite simply, an oversupply of nitrogen will not compensate for the under-supply of magnesium. - All nutrient elements are provided. - The correct species of these nutrient elements are used. - The nutrient feed is managed correctly to ensure all elements are available for root uptake. 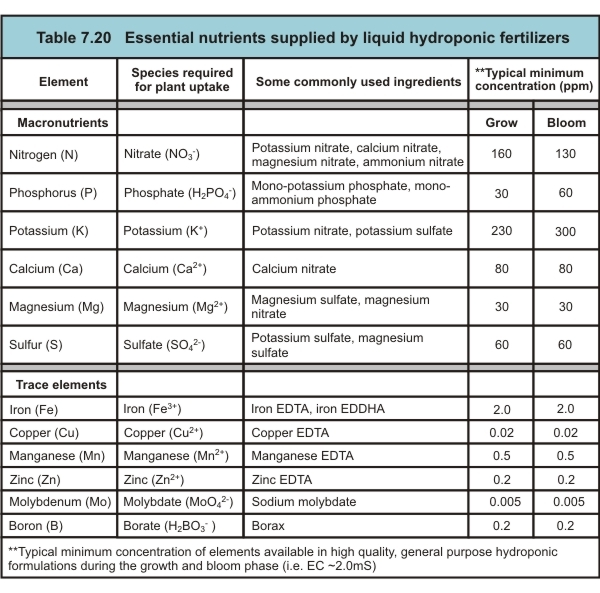 Satisfactory plant growth requires all nutrients being simultaneously available and in sufficient quantity (Table 7.20). The 6 “macronutrients” are those needed in the largest quantities. Of these, the 3 most important ones are the NPK fertilizers - nitrogen (N), phosphorus (P) and potassium (K). The “trace elements” are also needed but only in small amounts. Generally speaking, nutrients can only be rapidly absorbed by plant roots if they are in the form of mineral “ions” – as illustrated in the second column of Table 7.20. An “ion” is an atom or group of atoms which has gained or lost one or more electrons, and therefore carries a positive or negative charge. This “charge” enables ions to either repel or attract other ions. Ions with a positive charge (+) are called “cations” and are attracted to a root hair containing negative (-) ions called “anions”. In this way, nutrients are brought close to root hairs so they can be absorbed. “Inorganic nutrients” or “salts” supply nutrients in the mineral ion form. Provided pH is within the acceptable range, they are readily available for root uptake. Some common sources are shown in the “ingredients” column of Table 7.20. Note these will often be listed in the derivation statement on nutrient labels. Where “inorganic nutrients” (i.e. salts) come from: Inorganic nutrients are sourced from seawater and mineral deposits. The unwanted and nuisance salts are removed by a process called fractional crystallization. Hence they are “synthetic” only in the sense that they are purified by man-made processes. Pure organic substances such as humic acids and seaweed can add valuable components to nutrient solutions and soils. However, they have a limited ability to provide an actual ‘nutrient’ effect. The reason for this is that they typically contain only a narrow selection of macronutrients and trace elements, all of which are in an organic form. These “organic” macronutrients and trace elements must first be converted into “inorganic” nutrients before they can be absorbed by roots. Hence, pure organic nutrients are slow to act and give variable results because their conversion into inorganic form takes time and also requires the action of micro organisms. For this reason, inorganic nutrients are preferred. They are a short cut method of providing plants with exactly what they want, as required. It is worth noting that organic substances are especially important when growing in soil. They compliment inorganic nutrients by increasing the cation exchange capacity (CEC) of the soil. Although inorganic’s provide the nutrition, a high CEC helps prevent the inorganics from being washed away down through the soil profile each time the plant is watered. CEC is particularly poor in soils that are composed largely of sand. Therefore the distribution of organic matter (e.g. compost) throughout the soil profile will help increase nutrient retention. In hydroponic systems, CEC is unnecessary because the root zone is frequently replenished with nutrients. This is why the use of substrates of essentially zero CEC (e.g. Rockwool, perlite, clay pebbles) are perfectly suitable. It is necessary to “chelate” several of the ‘trace elements’ (Table 7.20) with compounds such as EDTA and EDDHA. Chelates are organic compounds that “complex” (or combine) with trace elements enabling them to remain water soluble within pH range 5 to 7. Although many brands use chelated iron, many do not use chelates for copper, manganese and zinc. This is a risky practice because these trace elements can be very unstable even if the nutrient solution pH exceeds 6.5 for short periods of time. Although the use of chelated trace elements is often claimed on some nutrient labels, other brands are unable to mention this because of the labelling regulations enforced in certain jurisdictions in which these are sold e.g. USA. Toxic species can be present in nutrient formulations because the nutrient manufacturer has chosen to use an inferior type or grade of ingredient. Ammonium: Toxic levels of this species can occur due to the use of excessive ammonium nitrate in the formulation. Ammonium’s concentration should represent no more than ~20% of the required total nitrogen concentration. An excess can cause damage to roots and stem bases, particularly in younger plants, which results in poor growth and yield. It is generally accepted that plants will not uptake nitrogen in the ammonium (NH4+) form – it must first be oxidized into nitrate (NO3-). Chloride: Toxic levels can occur due to the use of potassium chloride and/or ammonium chloride. Excess chloride will typically cause chlorosis (leaf yellowing) which results in poor growth or yield. Several years ago, one popular nutrient brand contained ammonium chloride. This produced ~250ppm of chloride when diluted 100-fold. At this dilution the chloride content alone would register an EC of 0.3mS.